Vasaka is one of the ingredients in Chyawanprash and is mainly viewed as a lung herb. It is a bronchodilator and is antispasmodic. It is often therefore added to protocols when there is a history of asthma, allergies, or labored breathing. It activates the enzyme trypsin. Anyone doing pranayama may also find it useful. It reduces kapha and pitta and may increase vata somewhat. Lesser known uses include topical use for ringworm. Ingredients: certified organic Adhatoda vasaka dried leaf powder. Bamboo manna is a starch that is rich in silicious crystalline substances that aid the growth of hair, teeth, bones, and skin. It usually called banslochan in India and is most respiratory formulas, including the famous sitopaladi. Bamboo manna is also rich in potassium. It is nutritious, especially for the nervous system, and is used in nearly all deficiency conditions, including those caused by intestinal parasites. The taste is quite palatable, a little chalky, so the powder can be added to homemade Chyawanprash or drinks made with milk or milk substitutes, including coconut. It is usually made with something a little spicy to avoid congestion. Ingredients: wildcrafted Bambusa arundinaceae powder. This item is currently back ordered with no ship date known at this time. Punarnava is a kapha removing herb that is used to restore normal fluid balance, proper flow of urine, and optimal weight. The name means "The One that Renews" and it is a major herb to consider with even severe kidney problems. It is, as noted, diuretic but also antibacterial and anti-inflammatory. It is used for spermatorrhoea and leucorrhea. Ingredients: certified organic Boerhaavia diffusa root powder. Cinnamon is,of course, a wonderfully aromatic and exciting spice, but it has potent medicinal value as well. In Ayurveda, it is used to kindle digestive fire and remove toxins from the gastrointestinal tract. It is an important ingredient in Chyawanprash, usually being added towards the end of preparation. It is used to promote deep assimilation of nutrients as well as to nourish the reproductive systems of both men and women. It is antibacterial and antiviral as well as antifungal. Ingredients: certified organic Cinnamomum cassia bark powder. Nut grass is one of the ingredients in Chyawanprash. It is a highly revered herb and is used in such a wide variety of situations that it is hard to pinpoint its role in rejuvenative therapy. First of all, the roots are considered to be effective against a wide range of abdominal and intestinal complaints, everything from menstrual discomfort to parasites. Secondly, they are anti-inflammatory and have an action on the brain that suppresses appetite, and this function works in tandem with a lipolytic effect that makes it easier to lose weight. Lastly, it has an effect on melanin that aids restoration of hair and skin color. Ingredients: organic Cyperus rotundus root powder. Elecampane is used as an antispasmodic, especially in chronic bronchial disorders. Its antihistaminic properties make it suitable for people with asthma as well as allergies to pollens. It is both antifungal and antibacterial. It is also antiparasitic, relaxing, and hypotensive. Do not exceed recommended dosage. Ingredients: wildcrafted Inula racemosa root powder. Vidarikand is a type of yam, sometimes identified as Pueraria tuberosa but what is offered here is Ipomoea digitata and is an official substitute for rare astavarga herbs in Chyawanprash. The root powder is sweet and nutritious and is used to promote milk flow as well as for enlargement of the liver and/or spleen. It is also a tonic for the elderly. It supports their "shukra" or subtle nutrients needed for the reproductive system and aging. It increase kapha and decreases vata. Ingredients: certified organic Ipomoea digitata root powder. Vidarikand is a type of yam, sometimes identified as Pueraria tuberosa but what is offered here is Ipomoea digitata and is an official substitute for rare astavarga herbs in Chyawanprash. It looks something like a morning glory. The root powder is sweet and nutritious and is used to promote milk flow as well as for enlargement of the liver and/or spleen. It is also a tonic for the elderly. It supports their "shukra" or subtle nutrients needed for the reproductive system and aging. It increase kapha and decreases vata. Ingredients: wildcrafted Ipomoea digitata root powder. Bhumyamalaki is known in South America as "chanca piedra" or stone breaker because of its alleged effect in breaking up kidney stones. In Ayurveda, it is used for urinary tract infections, but often its function is to promote healthy functioning of the liver and gall bladder, which in turn means that the herb also improves the complexion. Research shows promise with limiting both HIV and hepatitis B. Bhumyamalaki is also antibacterial and antifungal. 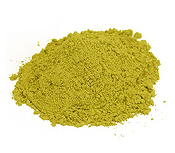 Ingredients: certified organic Phyllanthus fraternus herb powder. Long pepper is in truly an immense number of Ayurvedic formulas. It is considered to be an aid to digestion and rejuvenating. Because it is warming, it relieves mucus congestion and aids breathing. It nourishes the blood, nerves, and reproductive tissues. If relieves congestion in the biliary ducts and is used as a sedative for sleep disorders and epilepsy. Mainly however, pippali is carminative and used to promote proper assimilation of nutrients. Ingredients: certified organic Piper longum fruit powder. Bala means strength but because it contains a small amount of ephedra, it is labeled for external use only and not marketed as a dietary supplement even though the seeds and aerial parts have higher concentrations of controversial alkaloids. It is used in massage oils to build strength. Ingredients: certified organic Sida cordifolia root powder. Haritaki is one of the three fruits in triphala where it exhibits more purgative action than the other two fruits. It is also one of the ingredients in Chyawanprash. It is a vata pacifying fruit that acts mainly on the gastrointestinal tract where it removes toxins, nourishes, and rejuvenates tissue, having a special ability to normalize lipids. It is also used to treat fevers and anemia. Ingredients: certified organic Terminalia chebula fruit powder. Ingredients: wildcrafted Terminalia chebula fruit powder. Guduchi is an ingredient in Chyawanprash and is an adaptogen. It contains berberine and is a febrifuge that is considered to be as strong as cinchona. It is so revered that it is called Divine Nectar, Amrita. It"s nutritive for vata and pitta types. It is believed to remove toxins through heating, a property not assigned to many herbs. It has analgesic qualities and is used for rheumatic pains, jaundice, and serious infections, including hepatitis B and tuberculosis. It works extremely well in conjunction with turmeric to prevent liver damage from toxins. Ingredients: certified organic Tinospora cordifolia stem powder. Gokshura is used to treat nocturnal emissions, impotency, gonorrhea, and scabies as well as difficult urination. They are also used for incontinence, male infertility and low libido. Studies done in Bulgaria suggest that this tonic effect is achieved by stimulating androgen receptors in the brain. Numerous clinical trials corroborate the claim that gokshura improves sexual performance and libido in men. Gokshura is an ingredient in Dashmool as well as Chyawanprash where the primary function is to promote urinary tract and prostate health in men and uterine rejuvenation in women. Ingredients: certified organic Tribulus terrestris fruit powder. Calamus powder is commonly used externally during Pancha Karma or after Abhyanga (self-oil massage) to remove oil. It is a highly aromatic herb that supports the proper function of the lymphatic system and enlivens the skin. As an ingredient in massage oils, Calamus stimulates the body and helps to remove natural toxins. It can also be used in nasya (nasal) oils to sharpen the mind and increase awareness. Note: this powder is not intended for internal use. 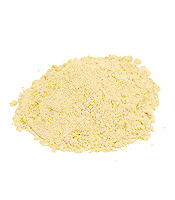 Ingredients: certified organic Acorus calamus root powder.